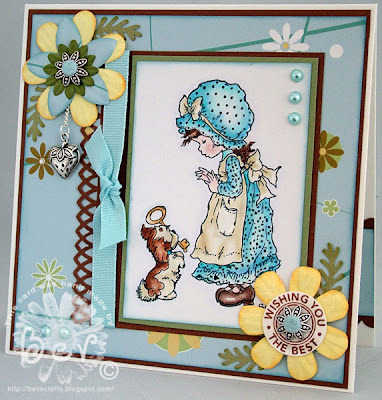 I've done this for Cute Card Thursday's challenge which is open so lots of scope to do anything you fancy. This card originally started off as something else but I had a change of heart half way through and ended up with this. I love this Tilda image, I think she's my favourite of them all. I've gone back to my old faithfuls - Papermania Simply Elegant papers (can't believe they have discontinued these!!). I'm still decorating the insides and backs of my cards, keep it up Bev lol. I've stamped around the white mat with a little Studio G scroll to break up the white a bit. And I had a tiny scrap of patterned paper left which just fitted on the back nicely and tied it all together. 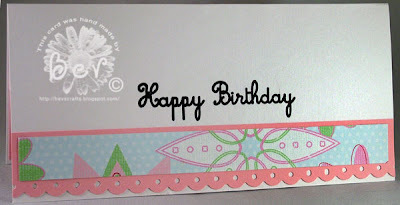 Label punch is from Stampin Up! I had such a job deciding which sketch to use for this weeks Sketch Saturday challenge cos I love all Jo's sketches but eventually went with sketch #17. I didn't want to use a Prima flower, it was too "pretty" for the feel of the card so I made one instead. It's quick and easy to do and I've done a mini tut on how I made the rustic flower, it's near the bottom of this post. 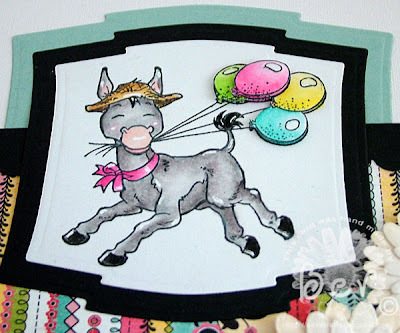 I've used one of the soon to be released Whiff of Joy Party Animals images - isn't this little goat just the cutest!! As soon as I saw this image I started thinking checks/ginghams/rustic and knew the new Laura Ashley papers would be perfect. 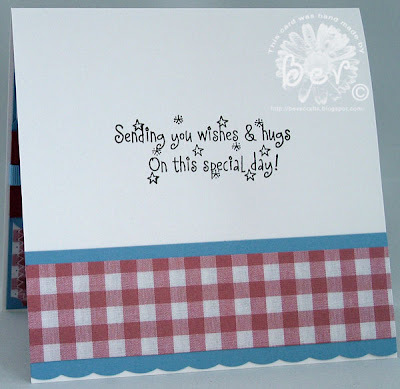 I Cuttlebugged the centre strip in keeping with the gingham backing paper and stitched around the edges of the paper. The scalloped border is done by punching out 3/4" circles and sticking to the back of the mat. I'm still loving decorating the inside and back of the card, hope I can keep it up lol. 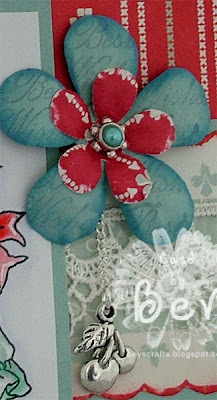 Here's how I made the rustic flower, sorry the close ups are a bit blurred. 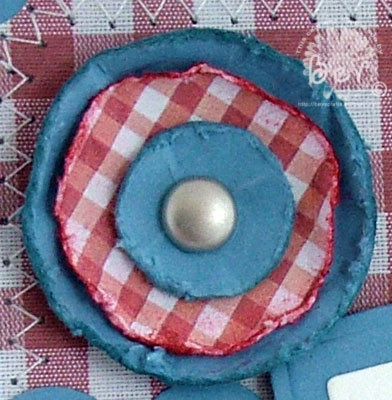 Distress the edges of the circles with a distressing tool and a nail file. Don't be afraid to crumple/crease the discs, crumpled and bashed is GOOD! Edge the discs with a matching ink and add a few more bends and creases for good measure. Assemble with a brad - the one I've used is from the QVC Cosmo Cricket TSV and was perfect for the look I wanted. I also received this award from Ceal, thanks for thinking of me hunny. I've already passed this on so if anyone hasn't received this yet please help yourself lol. Okay, so it's not so little - I made the PINK GEM DESIGNS team ... WOOHOO!! See, I told you it wasn't so little lol. 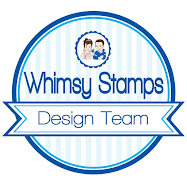 Thanks so much Janet for giving me the opportunity to work with these adorable stamps!!! I've only got one card today but might have another one later if I can get all my ironing done yuk!! This one is for Papertake Weekly challenge which has another of DawnyP's fab sketches. I'm also entering this in Cupcake Craft challenge which is to use something printed. The papers are a download from Designer Digitals (LOVE this set). Whilst having a tidy out yesterday I found this sweet stamp that I have not used in ages - she reminds me so much of my daughter Shelley when she was that age - always collecting shells and fascinated by the baby crabs. Oh what wonderful memories they are. 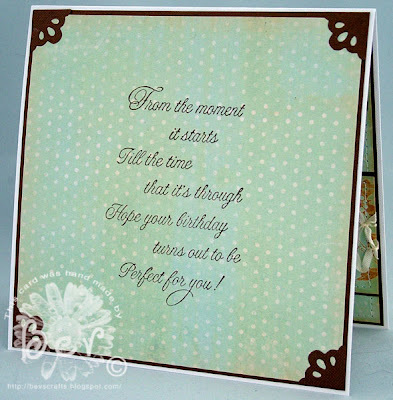 As soon as I saw this set from Designer Digitals I knew it would be perfect for the stamp, I love the aged look it has and the beautiful subtle colours that invoke memories of years gone by. I resized all the papers in Photoshop to 15cm x 15cm so I wouldn't lose the distressed edges of the pages. I added some stitching to carry the aged look through the card and went for the script sentiment on the inside as it just seemed to work perfectly with the theme I had in mind. I don't know the maker of the sentiment stamp on the inside of the card, sorry. I got it off Ebay a couple of years ago. Stamps Happen Collecting Sea Shells coloured with Distress Inks and H2O's. 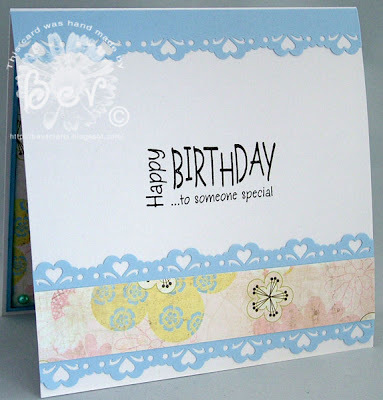 Sentiment stamp on the front of the card is by Stampin Up! Here's the first card I've made with the new release that's out on 3rd January - these stamps are by Alison Acton and once again are fabulous and fun!! 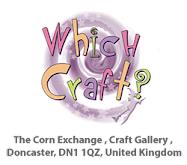 There is a release party on the 3rd of January on the Whiff of Joy group on Papercraft Planet, hope to see you all there. 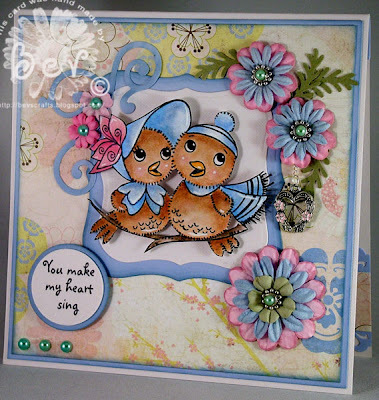 The sentiments that go with this release are fabulous, although due to the holidays the mail has been delayed and I am still awaiting the sentiment stamps but Katharina kindly let us have a sneak peek, so had to settle with using a SU sentiment instead. I've followed this weeks Mojo Monday sketch, another FAB sketch by Julee - love love love her sketches especially when the sketch calls for some white to show. I think it gives such a fresh look to the finished card. 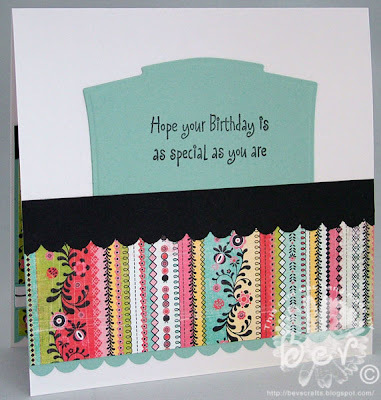 This card also qualifies for the Secret Crafter challenge which is paper piecing. I've stamped the balloons twice and raised them on sticky foam to 3d them. I've carried the theme through to the inside of the card, even managed to use the aqua off-cut nestie to stamp the sentment on. The last bit of DP I used on the back to finish the card off. The sentiments on front and inside are both See D's - I forgot I even had these and found them last night when I was huntiing for something else. You know when you buy these things then put them away for a few years .. yeah? Well that's me - I'm shocking for doing this!! I also found my Fiskars border punches that I've not used for ages and ages so had a play with this heart border punch, it's so pretty! 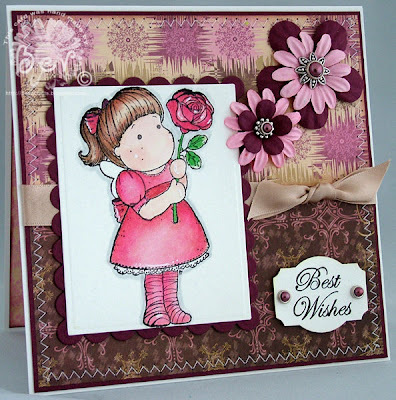 Two more cards today, both using the fab Pink Poison stamps that Marie sent me. 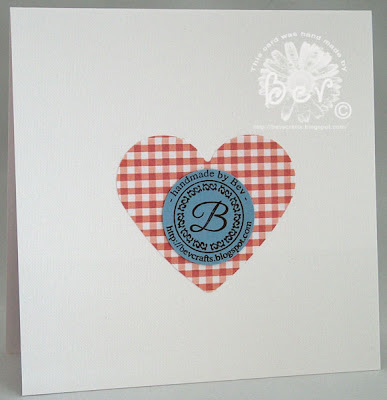 Love these stamps - the quality is fab and every impression is perfect. 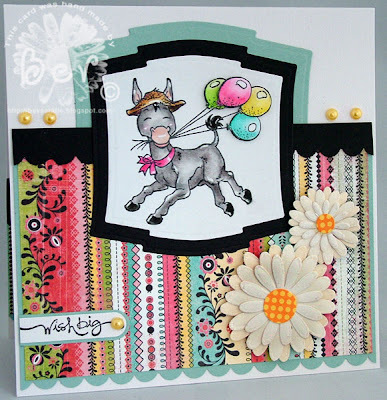 The next card is for Sketches by Tamara (sketch no 75). Tamara does the most awesome sketches, so perfect for the delish cupcake lol. Managed to get a half decent pic of the inside of the card. 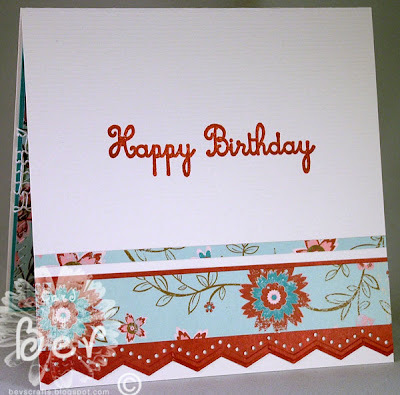 Flowers are Prima and punched with the EK Success medium Retro Flower punch. I hope you all had a wonderful day yesterday, I know that many of you have been struck down with this awful flu virus, so many of my friends spent Christmas day in bed :( and will not be having Christmas lunch till later on in the week. We all had this virus last week so thankfully were well enough to enjoy the celebrations. My daughter and her family had lunch at our house yesterday, it's wonderful to see Christmas through the eyes of a child. 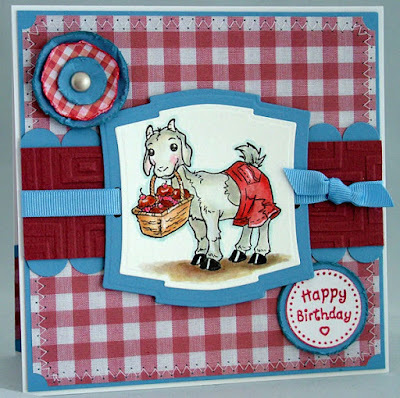 I've made two cards today - this one is for Just Christmas and Birthdays challenge which is a sketch by Rheannon. It was great not having to make a Christmas card (although I have promised myself I am going to try and make 10 a month so I am not rushing round like a loonie come next December - yeah right!!). I found this delish Autumn Leaves paper which I had forgotten I had even bought so built the card around this. I decorated the inside of the card with some of the scraps left over and a simple stamped sentiment finished the card off. 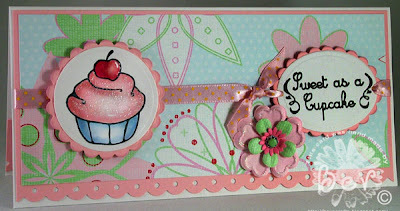 Pink Poison Cupcakes stamp set, Hobby Art sentiment (inside), Stampin Up Happy Everything on front. Also some NEWS!!! 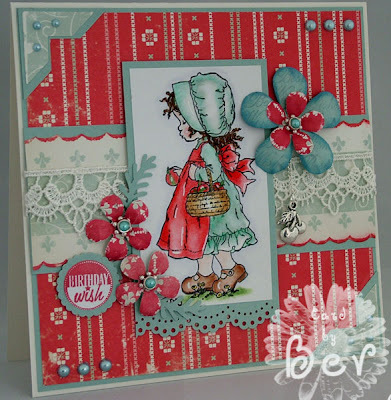 I spied on Katharina's blog that there is going to be a Whiff of Joy /Elisabeth Bell club kit which is going to be released soon and pre-orders will be taken in the new year. I adore Elisabeth's work so can't wait for this kit - ooooh my mouth is watering at the thought lol. So keep an eye on Katharina's blog and also the shop for updates. Better still, if you have not subscribed to Katharina's blog for updates pop across now so you can be sure to know when pre-orders will be taken. The last bit of Whiff of Joy news .... the postage charges for European desitnations has been frozen at 1,50 Euros on a continuing basis for all orders inside Europe, AND starting from today flatrate shipping to ALL international destinations at a rate of 2,90 Euros (approx. 4 USD) no matter how heavy your package might be. 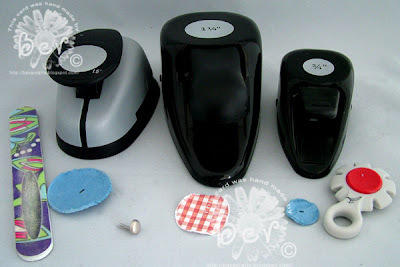 So you can spend your extra pennies on even more stamps lol. Now to my cards - I've two today seeing as I have not posted for ages. The first card is for this weeks Friday Sketchers and it's another brilliant sketch by the very clever Jacqueline. I'm well into this decorating the inside milarkey lol. 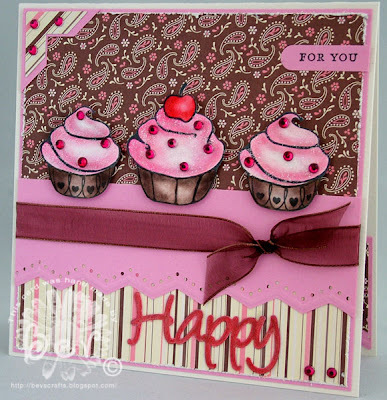 The Happy Birthday stamp is also from Pink Poison, from the Cupcakes set. The border punch is from Martha Stewart. I more or less carried the theme through to the back of the card, using the stamp from Ebay, the supplier kindly shared by Rach. I've had so many emails asking where I got it from so here's the link to the Ebay Shop. I got carried away playing with my Pink Poison stamps and needed a last minute card (there's always one you need just when you think you're done!!). I used Anna Griffin paper, punched a red border strip with a Martha Stewart punch then stamped out the poinsettia from the Xmas Birds set (LOVE this set) and heat embossed with Moonglow embossing powder in red and again in green. Cut the flowers out and layered, I used Beadazzled beads for the centres of the flowers. Punched out some leaves with a Punch Bunch fern leaf punch and assembled in a circle. A little bow on the top and a few gold bells dotted in for a splash of colour and job done. A really quick and easy card. 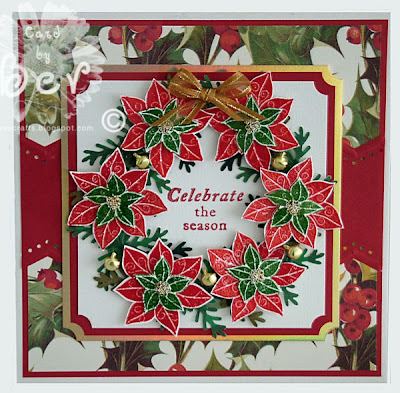 Love the poinsettias, the images are so detailed, even with heat embossing. The sentiment is by HOTP. I think this weeks Sketch Saturday challenge is perfect for the Penny Black 3-2-1 challenge, alhtough I had to tweak the sketch slightly by adding a photo corner instead of the 3rd flower at the top - it just looks too crowded (probably cos I used such a big image), and also added the ribbon which is not in the sketch but you know me and me ribbon lol. 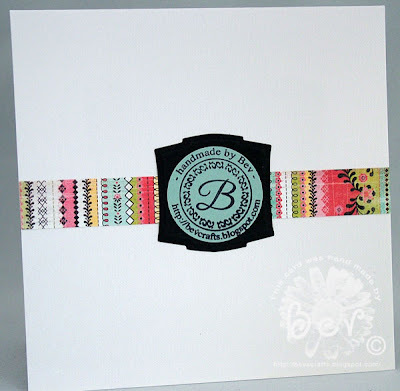 I got the monogram stamp from Ebay, thanks to Rach who pointed me in the right direction. 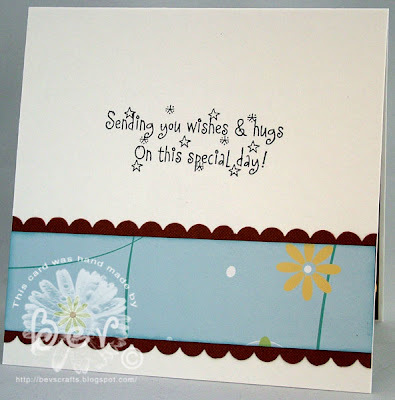 The challenge this week on CCT is punches - no die cuts. What!!! No Nesties?? GULP!! So I got out me punches and got busy. I found this lace at Dainty Supplies last week, loved it so much I bought the lot lol (although I did share some - didn't keep it all for myself lol). The pearls are from Sally, link in my side bar. 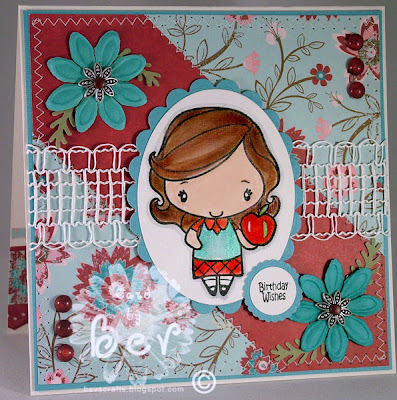 I've used my favourite Cosmo Cricket Little Dutch Girl papers - really love these. Once again to make the flower I punched out one of each size, stamped across the blue flower with a sentiment stamp, sponged the edges of the blue petals with Brocade Blue (SU) ink, scored 3 lines down each petal, flipped the flowers over and scored between the previous score lines. 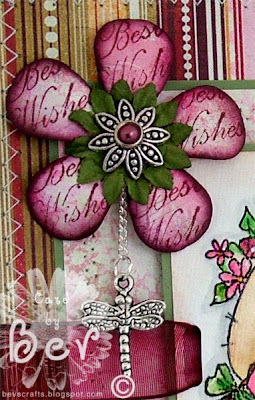 The cherries charm is suspended from the flower with jump rings and chain. Aren't you all just sick of Christmas cards now? I am, and am so glad mine are all done and posted - now I just need to get the presents bought and I'm set lol. yep, I've not bought a thing yet. Gulp - best get me skates on. 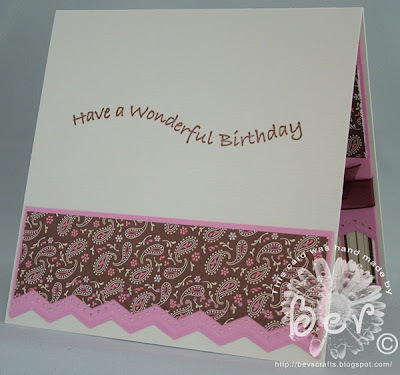 I thought I would make a birthday card for a change, and have used one of the new Sugar Nellies which was a gift from my wonderful friend Rach - thanks sweetie, I love it!! I've use this weeks sketch from Friday Sketchers, fab sketch and one I will use again. 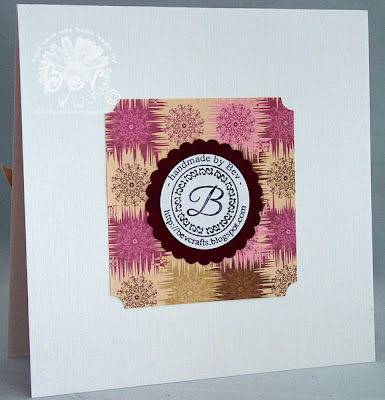 I coloured the image with the usual old Distress Inks and H2O's, I also used the gorgeous watercolour paints that Sally sent me, the burgundy in the set was just the colour I needed for this card. The flower is part punched, part Prima lol. I punched out a flower using the large Retro Punch and stamped it with a Best Wishes sentiment stamp using Bravo Burgundy ink, sponged the edges of the flower with Bravo Burgundy, then scored 3 lines down each petal, flipped the flower over and scored lines between the previous scored lines IYKWIM? I've received this award from Kim, if you've not seen her blog you've been missing out big time! Her cards are just breathtaking, so go take a peek. The rules are to give it to five others, who shall give it to five others.. You shall link the one you got it from, and also the ones you give it to:) And let them know. And there is more... You have to write down five things you are addicted to. I know it is a busy time so I understand if you just pass it on to everyone who visits you blog, but I would like to pass it on to these girlies. I wish I could give it to you all. At last I got to use the sweet little stocking from Magnolia - had this for ages and never got round to using it. I thought it was perfect for this weeks sketch at Magnolia vs Stampavie. It's the last sketch for this year so you have loads and loads of time to get it done. I coloured the images with Prismacolors for a change, and highlighted with H2O's for a wee bit of sparkle. The papers are from last years DCWV Xmas pad, the sentiment is a Sizzlits die. 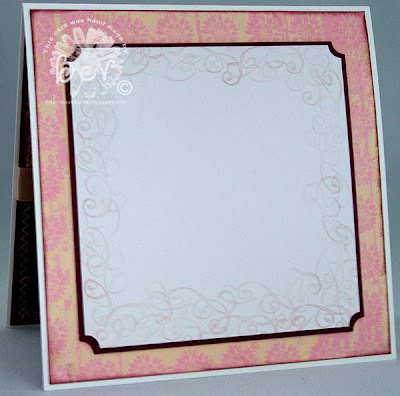 The corners are punched with a Stampin Up corner punch. Whiff of Joy challenge 10 - already! !